Anti-aging radiance and firmness cream - 50 ml (1.76 fl.oz). Crème lift & lisse is a global care offering a synergistic anti-wrinkle, firmness and radiance action combined with an optimal hydration in a deliciously melting texture. Its chocolate fragrance gives instant feeling of well-being. The senses are awakened, the skin and the mind are relaxed, your mood and your face glow altogether. • Tightening and smoothing effect : fills, smoothes and visibly reduces wrinkles and fine lines. The skin is nourished, replenished and firmer. • Hydration* : nourishes, repairs and reinforces the hydration to help skin fight against external aggressions responsible for premature signs of aging. • Radiance : skin is revitalized, replumped and tightened. Soft to the touch, it is brighter and more homogeneous. the imperfections are blurred and the surface of the skin appears smoother. • Self-defense : antioxidants help prevent free radicals chain reactions leading to DNA damage, among others, and generally inducing cellular aging. Soft, non-greasy cream, pleasant and easy to apply. 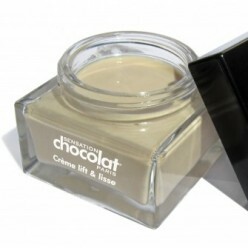 Discreet chocolate fragrance that transforms the application into a good mood booster. • Dynalift® : derived from from Sorghum juice, a herbaceous plant of African origin, it is rich in polysaccharides and sucrose. It forms a stretching film on the surface of the skin to provide an immediate and durable tightening effect. Visibly reduces wrinkles volume and the appearance of skin roughness. The tightening and film-forming effect significantly smoothes the skin’s contours and the micro-depressionary network becomes less visible. • Cocoa butter : moisturizing*, nourishing and protective. Rich in vitamins A, B, C, E, minerals such as iron, calcium, copper, magnesium and flavonoids (antioxidant polyphenols), Cocoa butter neutralizes free radicals, restructures the skin, prevents dehydration, soothes, invigorates the skin, provides suppleness and softness. It stimulates cell renewal and improves elasticity by increasing the level of collagen in the skin to plump it up. • Vitamin E : natural antioxydant providing protection against free radicals and environmental stress, slows skin aging and ensures the stability of cellular structures. Activates cell regeneration. Contributes to healthy tissues, protects the protein, collagen and elastin. • Vegetal glycerin : absorbs and retains water in the upper layers of the epidermis, leaving the skin intensely and sustainably hydrated*. Reduces the sensation of roughness, cracking and irritation. • Silicone Elastomers : fill-in creases, fine lines and wrinkles to instantly diminish visible signs of aging. These spherical particles make it easy to spread the cream evenly with a pleasant feeling. Its microscopic particles reflect away light, softening skin tone (soft-focus effect). Provides a brighter complexion and leaves the skin feeling velvety soft. * hydratation of the superficial layer of the epidermis. Cocoa Butter contains a kaleidoscope of vitamins, minerals and natural mood-boosters. It nourishes, hydrates and protects the skin. Sensation Chocolat Paris offers 8 professional care treatments and 24 retail products for unique moments. Relaxed and enveloped in sweet scents of chocolate, experience the incredible sensation of skin comfort and glowing complexion. Discover our latest professionnal or retail products and their benefits and enjoy an extended chocolate experience !